Every year, hundreds of thousands of acres of land burn across the United States and wildland fire fighters (WFFs) are asked to protect our lives, our homes and our forests. But fires are unpredictable and dangerous. In fact, over 200 on-duty WFF fatalities occurred between 2001 and 2012. WFFs often work long hours for many days under stressful conditions, which can negatively impact their health, increase the likelihood of on-duty injury and affect performance. 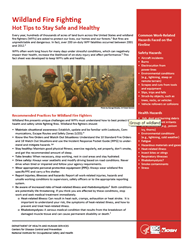 This fact sheet was developed to keep WFFs safe and healthy.